Let me just come right out and say it - I'm in love - I mean REALLY in love with this product. Although our test bike was a Suzuki DR650, Cyclops makes replacement LED headlight bulbs for pretty much everything out there. That said, the DR650's stock headlight bulb is about as anemic as they come - think candle. Until recently, LED headlight bulbs could only be found for cars. We've been waiting for this vastly superior technology to trickle down. Companies like Denali and Clearwater made available LED "winglights" that produce stunning great illumination. But not the headlight itself. With Cyclops now on the market, the long wait is finally over. And they've done such a stunning job. Reasons to go with LED over any of the alternatives are many. But all one really needs to know is that they out a lot more light for a lot less power, and they're far more durable, lasting at least 10 times longer than their incandescent cousins. A standard H4 bulb puts out about 1,100-1,500 lumens while consuming about 55-60 watts. In comparison, the Cyclops LED H4 pumps out a whopping 3,800 lumens at only 20 watts (low beam) and 40 watts (high beam). 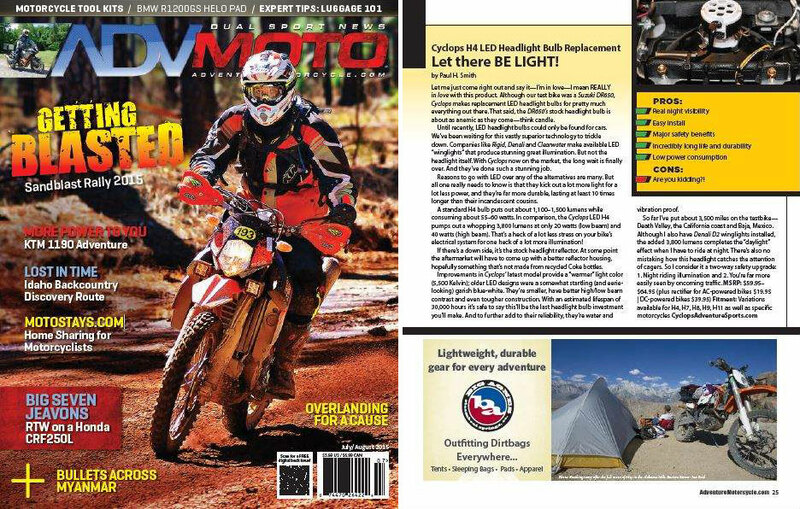 That's a heck of a lot less stress on your bike's electrical system for one heck of a lot more illumination! If there's a down side, it's the stock headlight reflector. At some point the aftermarket will have to come up with a better reflector housing, hopefully something that's not made from recycled Coke bottles. Improvements in Cyclops' latest model provide a "warmer" light color (5,500 Kelvin); older LED designs were a somewhat startling (and eerie-looking) garish blue-white. They're smaller, have better high/low beam contrast and even tougher construction. With an estimated lifespan of 30,000 hours it's safe to say this'll be the last headlight investment you'll make. And to further add to their reliability, they're water and vibration proof. So far I've put about 3,500 miles on the testbike - Death Valley, the California coast and Baja, Mexico. Although I also have Denali D2 winglights installed, the added 3,800 lumens completes the "daylight" effect when I have to ride at night. There's also no mistaking how this headlight catches the attention of cagers. So I consider it a two-way safety upgrade: 1. Night riding illumination and 2. You're far more easily seen by oncoming traffic.